Only adds 6hrs to go over the top.. Wierd.. Strange.. going over the top of Lake Superior only adds six hours to the drive time to Torch Lake, Mi. We all had a great time on Spring Park Bay, Lake Minnetonka. There were about 20 some boats out for our scrub races. We had lighter breeze and very smooth ice with the flower petal, hoars frost on the surface of the lake. It was a nice sunny day, a bit warmer then you might have thought for all the talk of the cold weather, not a warm day, but it wasn't super cold. The McDonagh Brothers Annual Holiday Party is tomorrow, Thursday night. It's also a celebration of my brother, Jonathan's 50th Birthday. See the new Silver Fleet World Champion Cup, donated by Leon before it has to go back to Europe. Iceboaters are invited to come by to eat, drink and discuss where we are going to be sailing this weekend. Sorry to all of the users that signed up and their account didn't become active. The spammers were signing up so many users that I was getting a lot of user requests and I stopped sorting out the real from the spammers. All the accounts are active now, so If you are one of the 727 users that signed up, since I stopped doing my administrative tasks.. you should send yourself a new password, and login. The regatta was finished this morning when we got out on the ice and it was a whiteout.. nice coating of snow all over so you couldn't see the hazard, not that that matter, because there wasn't any wind either.. So we are heading home and I guess that there might be some good local ice!! 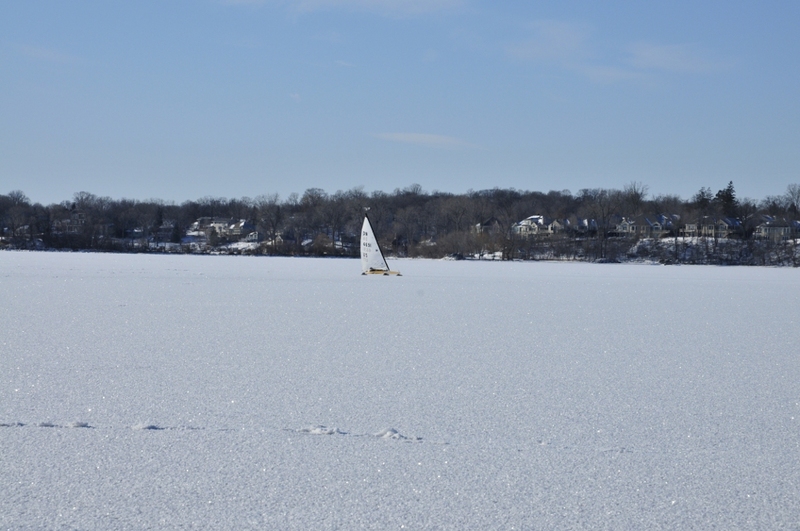 Today the fleet got out on the ice early and in light winds got in 5 gold & 5 silver races. 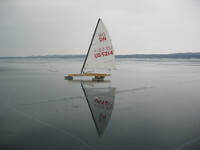 Yesterday racing was called off because of the ice conditions/wind speed.. This morning, (Wednesday) we left Traverse City at around 8:30 to go see if we were just going to pick up our boats off the ice, or if it was going to be a rescue mission. Everyone else had already taken their boat off the ice. Music: Nick Cave and the Bad Seeds, Babe I'm on Fire. This is dedicated to my girlfriend Molly. That's all the gear you need to be the 2009 DN World Champion. Matt Struble's fast little Ron Sherry (Composite Concepts) DN. I got to be a little like Matt and with my own quick little Ron Sherry boat, I just tried to be consistent (like Matt at last years worlds) and sail my best and now I get to take home the new (thank's to last year's silver fleet champ, Leon) Silver Fleet World Champion trophy! Yipee!.. It was a spectacular day out on torch lake. There wasn't wide spread shell ice, and the little that was there wasn't really a problem. The ice has been amazing, Friday 3:00am 3-5" of crusty snow. Saturday 10:00am, all the snow had melted. Sunday 10:000am all the water had seeped through and hardly any shell ice.. The ice was hard and smooth, with some texture here and there, but no real hazards or rough spots. 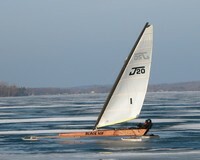 I had my best day ice racing, with a 4,3,3 in the silver, (tied for 1st). We got here.. but we needed some help..
We arrived in Traverse City and it's late so off to bed.. The trip wasn't without incident, the trailer broke behind the tongue and we limped it to the coolest welder in MI. Father, Owner, Mechanic of Rhonda Konitzer. How the 2008 Challenge went down..
Thursday. The travelers from Poland, Germany, the East Coast and Central Regions arrive on thursday to a cold windy day. Like 10deg F and 20 gusting to 30mph. 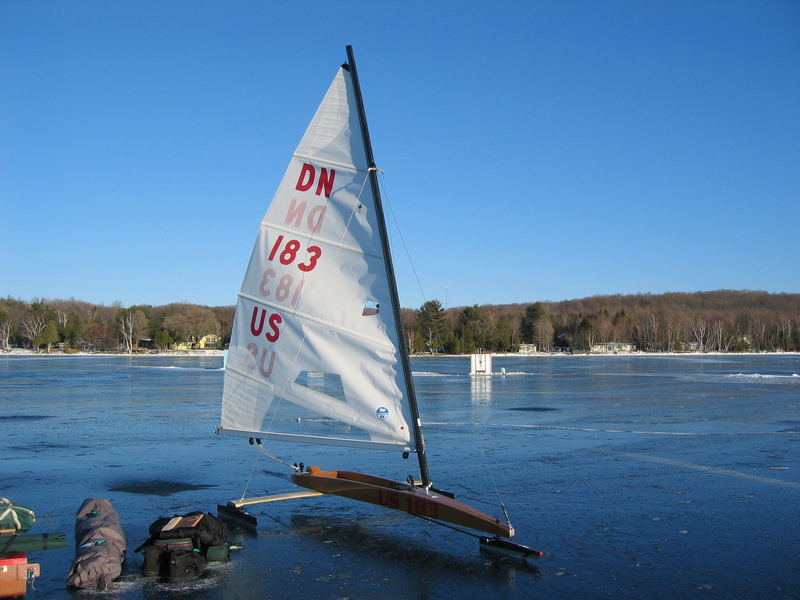 Like true iceboaters they go out and give a very detailed ice report (they rated it as a 6-7). There's a few ice heaves going across the lake. It is black clear ice with a orange skin surface, and small drifts. Got the new hull online. On Friday there was too much wind.. It was pretty crazy out there.. with some cracks in the ice, and we even abandoned the last race after Steve Orlebeke went into a working crack going upwind... that was it for the day..
Before the Stern Steerers got off their first race (they go last), there was a little incident in the pits... the duece got loose..